With computers used in nearly every aspect of today’s world, knowing how to build, repair, and network computers has become critically important to businesses as well as a top career choice for many college students. 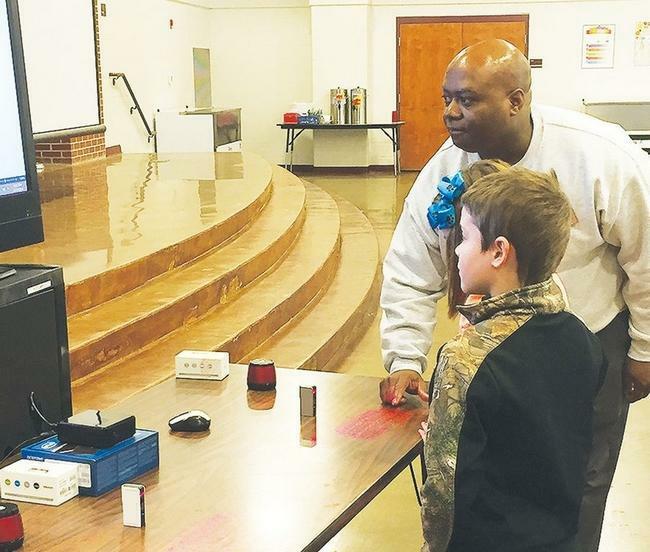 Showing students what they can learn if they enroll in classes at Phillips Community College of the University of Arkansas when they graduate, PCCUA Network Administrator Arthur Gentry visited third graders at Barton Elementary this week demonstrating three different computers that he and his students built. The first computer he showed them was built with no outer cover, so that the students could see the inner components and mechanisms of the computer while it is running. Gentry and his students constructed lighted fans on top of that computer to keep the components cool. The second computer was also built without a shell and was submerged in a tank mineral oil to keep the components from overheating. Gentry explained that the oil is a conductor for the heat generated by the computer. The third computer he demonstrated was a much smaller computer housed in a small, black box. This computer had no keyboard. He invited students to try to use that computer without a keyboard, and they soon found that they couldn’t. He then flipped a switch and created a virtual keyboard, through which a QWERTY keyboard was projected onto a table. The third graders were excited to each get to type their names on a screen using the virtual keyboard. As computer networking has become a normal part of everyday life, careers as computer networking specialists and administrators have grown out of necessity. Computer networking specialists work to keep the networks going. If a network goes down, businesses can’t function normally causing a decrease in production. Computer networks are also vital in terms of communications for business and industry. Computer networking specialists quickly learn problem-solving skills necessary to keep the network up and running. They also maintain the software and hardware, monitor the network for potential problems, analyze problems, and develop plans for potential solutions. Technical support knowledge can be beneficial in network administration because students learn how to handle problems when they arise and introduces them to a broad range of products and computer functions. For more information about careers in networking technology and registering for these types of classes, call Monica Quattlebaum, Information Systems Technology advisor, at 338-6474, ext. 1331, or Linda Killion, PCCUA Dean of Business and Information Systems and Applied Technology, at 870-338-6474, ext. 1368.